TouchPad to launch June 12? 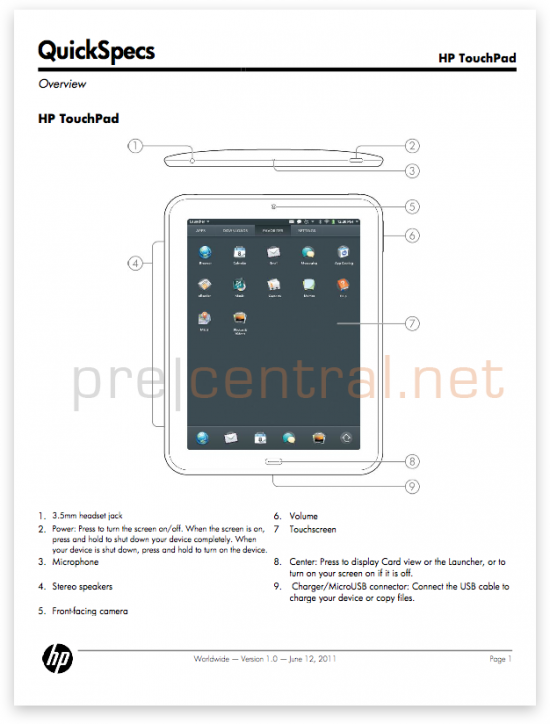 Thanks to an enterprising tipster, we’ve managed to get our hands on HP’s “QuickSpecs” technical specifications sheet for the TouchPad webOS tablet. The four-page document is something that HP puts together for their business customers and resellers (see examples here and here). They cover basics like what features are located where, model numbers and accessories, hardware specifications, and a slew of other bits that prove to be the bread and butter of the corporate IT buyer. So a worldwide release for the TouchPad on Sunday, June 12th? Of course, this could change - the document was titled "current" - but it does jibe with evidence that is coalescing around early June. Don’t worry too much about that “Version 1.0” part, as it seems that’s HP’s way of noting that this is the first iteration of the TouchPad, in line with their version scheme for other products (for example, the EliteBook 2740p Tablet PC is on version 15). HP uses the version numbers like software numbers, denoting when a product has seen a spec bump, which happens often in the lifespan of an HP notebook or desktop model. We don’t expect it to happen that often for the TouchPad – our pocket books won’t be able to keep up! Either way, June 12 isn't that far off - less than two weeks, actually. Just announce the date already, HP!